Louisiana has always been a state steeped in exotic scenery, elegant food, and dirty politics. Politics there was never more corrupt, as Frank Wetta so thoroughly documents, than during the Civil War and Reconstruction. 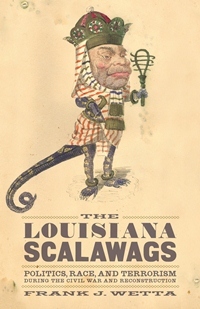 Wetta reminds us that the term “scalawag,” used during that time “was a vicious slur often used with deadly intent.” It referred to “Southern white Republicans in positions of influence and leadership, or those native white men identified as voting the Republican ticket.” They were distinct from “carpetbaggers,” that is northerners who came to Louisiana after the Civil War. When joined by newly freed African Americans, these groups formed an unholy trinity in the eyes of most southern whites and a serious impediment to reinstating the dominant role the prewar plantation elite played in state politics. Wetta asks and answers most of the important questions. Who were the leading scalawags? What role did they play in founding the Republican Party in Louisiana? Did they really believe in racial justice and political reform? What was the importance of the New Orleans riot of 1866 to Reconstruction policies in the South? What is the legacy of the scalawagism in Louisiana history? The New Orleans riot of July 30, 1866 rightly forms the core of Wetta's investigation. Spurred by a radical attempt to rewrite the state constitution adopted in 1864, “the riot turned congressional and northern public opinion against the conservative, lenient Reconstruction program of President Johnson, gave weight to demands for harsher policies toward the defeated South, and contributed to the first impeachment effort of an American president.” It also marked the high water mark for the scalawags. The era of carpetbaggers and their black allies dominated Louisiana politics for the rest of Reconstruction. Wetta tells a compelling story. His narrative, however, would read better if it were not shot through with the language and style of the dissertation from whence it surely came. Nevertheless, studies like this will help put Reconstruction on a more scholarly footing, thereby shining new light on America's first experience with military occupation and nation building.